Straighten your teeth with lingual braces at our London dental clinic on the Kings Road in Chelsea. 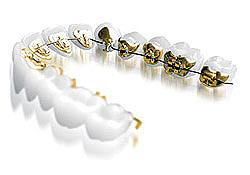 They allow for the correction of misaligned teeth using a hidden fixed brace bonded on the inner surface of your teeth, and deliver reliable, predictable results for the correction of all types of orthodontic problems, such as: crooked teeth, crowded teeth, gaps between teeth, overbites, underbites and crossbites. It is the only 100% customised, invisible, fixed braces system available, and is ideal for those who want to straighten their teeth without the braces showing. It is suitable for children, adolescents and adults, and works for all issues that require substantial movement of the teeth where removable brace types, like Invisalign and the Inman Aligner, may not be suitable. A lingual brace works in the same manner as a conventional fixed brace, giving maximum control and movement of your teeth. It works by applying gentle, continuous pressure on your teeth, that slowly shifts them into a more atheistically pleasing position. The difference between the two is that with a lingual brace the brackets and wires that comprise the brace are positioned behind the teeth, on the the tongue side, instead of in front of them, as with a standard brace. The primary benefit of having the brace fitted on the lingual side is that it makes the brace nearly invisible to others. No-one will know you’re wearing it unless you tell them you are. That is the reason why many people opt for lingual braces: they don’t want braces visible across the front of their teeth as they feel self-conscious about wearing them for for aesthetic reasons. The two types we specialise in are Incognito lingual braces and the WIN lingual system. Our in-house orthodontist at our clinic in London will evaluate the specifics of your orthodontics issue and recommend the best option for you. At your first appointment, we will take impressions of your teeth that we will then send to a dental laboratory for your custom made brackets to be produced. We will show you predictive images of how your new smile will look, so you will know in advance what improvements you can expect to achieve. Both the brackets and the wires of lingual braces are engineered individually with the latest state of the art CAD/CAM technology. Each of the brackets – there is one for each of your teeth – is custom made to fit the natural contours of the back surfaces of your teeth. This customisation results in a flatter, less obtrusive design, which ensure they are more comfortable to wear. At your second appointment, our orthodontist will bond the brackets onto the back surfaces of your teeth, then attach the wire to the brackets and tighten it to begin the teeth straightening process. The treatment can take anywhere from 9-24 months to complete, with the varying timeframe being based upon the severity of your teeth misalignment at the outset. The first sign of improvements should be apparent in just a few months though. For the first couple of weeks after the fitting of your brace, your teeth, tongue and lips may feel sore, as is common with fitting of any brace. After a short adjustment period, the discomfort will disappear and you’ll be able to eat and speak normally. Having a great smile is worth this temporary inconvenience. To find out more about lingual braces, or to book an appointment at our dental clinic in London, call 020 7148 7148, email info@thewellingtonclinic.com or send us a message using the below contact form.